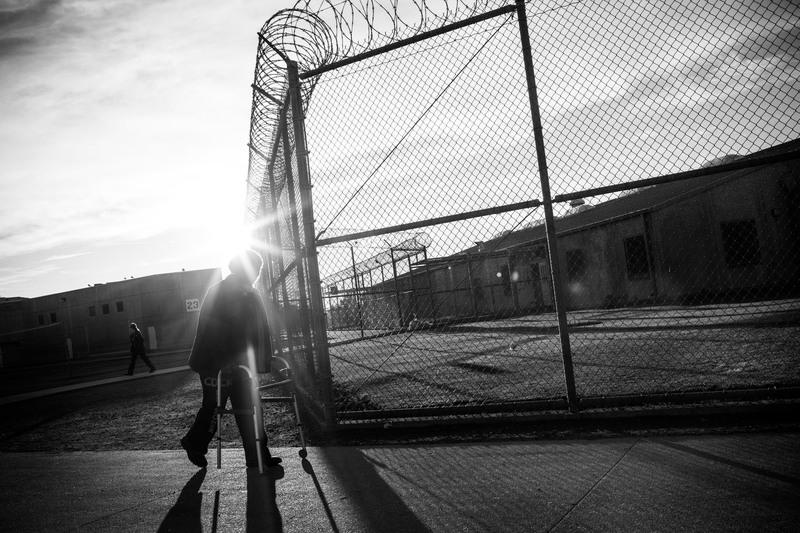 George Whitfield, age 56, uses a walker to walk to the physical therapist's office for an appointment regarding shoulder pain, at California State Prison, Solano, on December 16, 2013 in Vacaville, California. This is Whitfield's fourth time in prison - his current sentence is six years, though he hopes to be paroled before then. He was sentenced for possession of narcotics with intent to sell and an illegal firearm. Whitfield denies the charges, saying police searched his house without presenting a warrant and only found marijuana that he used personally and a firearm he kept in his home. His previous three sentences, dating back to 1989, were allegedly for possession of marijuana, which he says he has only used recreationally. According to Whitfield, he suffered a stroke in 2007, which now forces him to use a walker. He also suffers from high blood pressure, which was diagnosed in prison, and has recently been experiencing pain in his left shoulder, causing limited mobility and periodic numbness in his left arm. While Whitfield believes the prison officials at Solano are "fair, they're only doing their job," he also laments, "they should have sent me to rehab...they're not trying to save my life, they're trying to ruin it." He continued, "I believe in second chances, I would love to see [some of my fellow inmates] go home - they don't belong in here. This is overkill....we're still human"